So I didn’t plan on doing anything nail related today, but I wanted to play with one of my new polishes that came in the 3 Free Zoya promo (for those of you who don’t know, Zoya did a promotion where they gave three polishes away for free when they hit 20,000 facebook fans). I ended up liking the result so I figured I’d show you right quick. For this manicure I used one coat of Zoya Valerie with one coat of Northern Lights Top Coat. Since the top coat is so sparkly, you can’t see the glass flecked goodness of this polish in my pictures. The polish is an amazing purple with a wine/chocolate/red colored glass fleck finish. See here’s the thing, I was sort of scarred growing up with all of the purple (and hearts) I was given (suitcases, dresses, PJs, shirts, etc etc etc) because the people around me loved purple and thought I did too… well I didn’t. So now I have a natural aversion to purple, but I LOVE this polish. 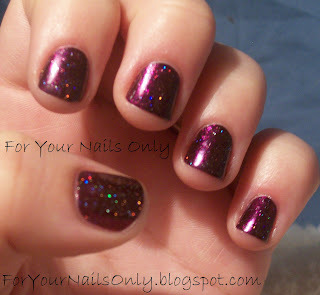 I love it even more with the holo top coat but it could definitely be worn without it for a more sophisticated look. PS Note my thumb is turned in all three pictures. Its healing well enough so I suppose more OPI Art Series shall arrive tomorrow!! Stay tuned! 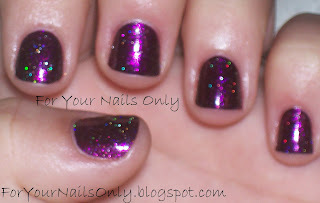 This entry was posted in Reviews and tagged holographic, Northern Lights, purple, shimmer, Zoya by Tara. Bookmark the permalink. You HAVE to love this purple!! And Zoya does them right too. Adorable combo! Can't wait to see a design. I just got valerie today, it looks awesome on you! Gorgeous! I ordered Valerie in the promotion so I cannot wait to receive this! Oh that's a great color! I'll add it to my wish list! I'm hoping my three come soon! its beautiful! i know what you mean with not liking a colour! i use to receive everything in pink! and now its growing on me!